I’m a simple man, and at times I like simple games. At its core, Monster Hunter Dynamic Hunting ($0.99 until Oct. 24) is a simple game. 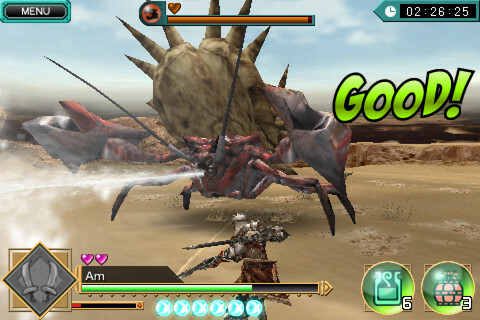 The object is to defeat various monsters in an arena setting. This isn’t a game where you run through corridors seeking treasure and fame. Every duel has a timer you need to beat. Each monster has different attacks and defenses; a gorilla may be vulnerable to head attacks but his stomach is heavily armored. So, you need to plan your attacks instead of just standing there hitting the thing with your sword. Although, take it from experience, sometimes that works in a pinch. At the end of each match you get a letter grade based on how long it took you to win your fight, your ending health, etc. It’s a good way of getting you to want to improve your performance, as well as a somewhat humbling experience. What do you mean I got a D? I won the fight, didn’t I? Apparently this is a game where style points matter. The graphics are good. Not great, but good. While they don’t fall into the category of something like Infinity Blade, they don’t make my eyes bleed, either. Getting used to the controls took a little bit of time, too. I’ve got large fingers and an old brain and I had a hard time remembering whether dodging was a swipe or two-finger tap. Also, since this an iPhone-only(s aapl) game (it will run in 2x mode on an iPad, but it’s not optimized for it) I found my fingers blocking some of the action on the screen. Monster Hunter is on sale this weekend for $0.99 to celebrate their new update that adds four new monsters and some gameplay improvements.